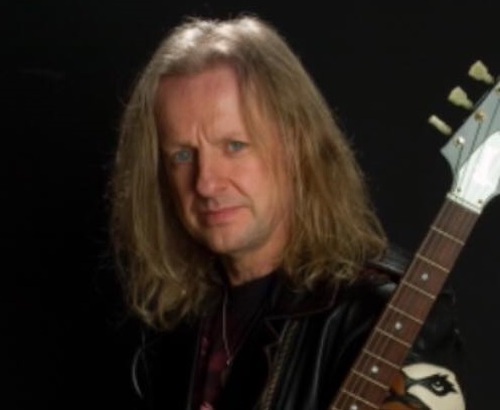 Andrew Catania of All That Shreds Magazine spoke with original Judas Priest guitarist K.K. Downing. Excerpts from the interview appear below. All That Shreds: Do you think it was unfair that they didn’t ask you to come back when Glenn announced his condition? Do you think Andy Sneap was a good fit? K.K. Downing: Totally unfair. People come and go in bands. Rob left for 14 years and came back to the band. Even today I’ve still been in Judas Priest longer than Rob. I was in the band three years before he joined. Andy does look out of place. I would imagine he’s going to go back to producing. All That Shreds: When you announced your retirement in 2011, was it more frustration with the direction of the band was going? K.K. Downing: Initially, I sent a letter that I’m bowing out gracefully and retiring. I tried to do it in a certain way not to burn bridges. When management and the band announced my retirement, something flipped in me and I just told them the truth. I chose my words carefully but it was still things that certain people didn’t want to hear. I wasn’t happy for a long time. The decisions that were being made and certain attitudes on people. I didn’t buy into that. I bought into a plan that every band member was equal in the decision making. I’m still an equal shareholder in Judas Priest Music, LTD so it’s all a bit confusing and awkward. All That Shreds: When did you start getting unhappy with the bands’ direction? K.K. Downing: Glenn and I were two different people and I had an awareness of this at a young age. Glenn and I never had a bond as a band should. I don’t have complaints about what we achieved. I used to get really really frustrated with Glenn. Fame and fortune can change people and you start to see a pecking order starting to formalize and that’s usually when problems start creeping in and bands have major issues. This is what happened to us. Rob left the band, and we just made Painkiller, for f–k’s sake. All That Shreds: Why did Rob leave priest back then? K.K. Downing: He’s never told me. I can only think that Rob wanted to cut free and announce he’s gay. He didn’t make that announcement for six years until we announced we had Ripper as our new singer to deflect attention from Jugulator. I believe Rob left thinking he could be like Ozzy,, go it alone and have all the fame and glory to himself. All That Shreds:Comparing Rob to Ripper, who do you feel is a better fit for Priest? K.K. Downing: Physically and technically Ripper is a better singer than Rob because Tim was always in tune. Rob is good. Rob got better after he started using in-ear monitors. Ripper would murder the show and we’d come offstage and the fans would be saying good show but when’s Rob coming back? All That Shreds: What were the events that led up to Rob coming back to Priest? K.K. Downing: Sharon Osbourne called and asked if Rob was back in the band. She was going to pay us a lot of money to play Ozzfest. It didn’t happen the first time. The same thing happened another year. By this time, we’ve done the Demolition album and things seemed on the decline for us. The venues were getting smaller and smaller. Glenn wanted to produce the album and I wasn’t happy with that decision. I stepped away from the project for a while but came back and did what I could to contribute. Our past albums were getting popular again as Sony re-released our back catalog and Painkiller was getting popular. Painkiller wasn’t that popular when we released it. I feel it was fan demand. I’m involved with a music venue not too far from me. We put Skid Row on stage with their new singer. I thought he did a fairly good job. I saw some lives shows from before with him and didn’t think they were good. I’m used to seeing Skid Row playing festivals with Guns N Roses and such. It’s not the same without Sebastian Bach. All That Shreds: Do you have any contact with anyone from Priest? K.K. Downing: None. They don’t respond to any of my correspondence. Glenn is always the one that controls the behinds the scenes with Jane from management. It’s a bit like a John Lennon/Yoko syndrome. Andy and Ritchie are on a wage. They’re not really part of Judas Priest. The band is Judas Priest Music. I’m 25% shareholder and Director of that company. It’s a bit of a mess, really. All That Shreds: Why did you auction off your rights to Judas Priest music? K.K. Downing: Unfortunately, time isn’t on anybody’s side. I sold them off outright. Time isn’t on Glenn’s side or mine. We’re either approaching 70 or over 70. You start living off borrowed time. There’s really no place for egos. It’s all about being grateful for what and who we are and what we achieved. It’s comes to a point when the fans are more important than anyone cause you need them to stay with you. All That Shreds: When you first joined Priest, did you ever think the band would be as popular as it is today? K.K. Downing: You don’t think like that. You think more I shouldn’t be doing this but I’m a naughty boy and I want too….Sometimes you can release an album and it will fail cause it’s too soon to release. That’s happened to us on a few occasions. All That Shreds: What are your plans for 2019? K.K. Downing: I get tons of offers to do music. I was more dedicated to Judas Priest than Rob or Glenn ever was. Glenn took six years off to do his albums. Rob took 14 years to do his. Rob released two albums in 2010 with the Halford band and did Ozzfest. Somebody like me can only take so much. Then I got a call from management to start writing for a five-track EP. They asked back in 2000 and again in 2010. That was one of the reasons I quit. I told them I’m not doing it. Read more at All That Shreds. For more information on K.K. please visit his website. Keep in mind too that Glenn didn’t let Tim write for Priest..Tim did some great stuff for Priest…but I am really looking forward to this A New Revenge album because Tim wrote for it…I am thinking this might be the best thing he’s ever done. I like ripper but nobody can replace the metal god. There is a song called silent screams on rob’s first solo album and it sounds like 5 different singers are on the track but its only rob! He is the greatest singer and showman from old school metal and lets not forget that he wrote most of those great songs with priest! Well, sounds like a lot of regret from KK’s side of the camp. He quit the band. Live with it. Rob and Glenn must feel that KK might be a virus they don’t need right now. KK, you quit. Your decision. Stop with the sour grapes. May be he’s trying to create that band disfunction that the RRHF seems to like cause. It causes controversy because they feel it’s the best sort of press for them (example Ki$$). THIS IS HOW THE WORLD COMES TO AN END. NOT WITH A BANG, BUT WITH A WHIMPER! The geniuses behind some truly great music are now 70 year old wash women trashing each other on the internet. Second Coppala reference: HOW DID THINGS GET SO FAR? This is like the fights that occur at old age homes. Is K.K. going to steal Rob’s teeth? K.K, for God’s sake man, just tell people that you’re proud to have been part of something great and you wish them well. Stop it with this nonsense. What next? Ian Hill stole ENSURE? LIVING AFTER 8 PM? SOME HEADS ARE GONNA DROOL ALL OVER THEMSELVES. You know why I hate the internet and TWITTER and FACEBOOK because people no longer know when to stop. This is very undignified. The guy left the band and perhaps made bad investments and now the market for him has dried up. Golfers don’t really like SCREAMING FOR VENGEANCE and RAM IT DOWN. I’ve never seen a SUICIDAL TENDENCIES hat worn on a golf course. Collect your SOCIAL SECURITY, take your pills, enjoy the movies at 11am on Tuesdays, and wait for your kids to take your car keys away from you. You need work, help Iommi remaster FORBIDDEN. Can someone get a tentative release date? That is really, really offensive Monet…for God’s sake man, that album doesn’t need any remastering, or remixing! There’s nothing wrong with the sound of that album; it has a very natural sound to it, it sounds fine..just play the copy you already own! What’s wrong with how it sounds? No it isn’t…that’s just ignorant…so, I guess Monet isn’t headed the same direction everyone else is? Right, make fun of a class of people that YOU are inevitably going to join…that makes sooo much sense.